Hey there! Thanks for dropping by Reviews by Lantern's Light! Take a look around and grab the RSS feed to stay updated. See you around! 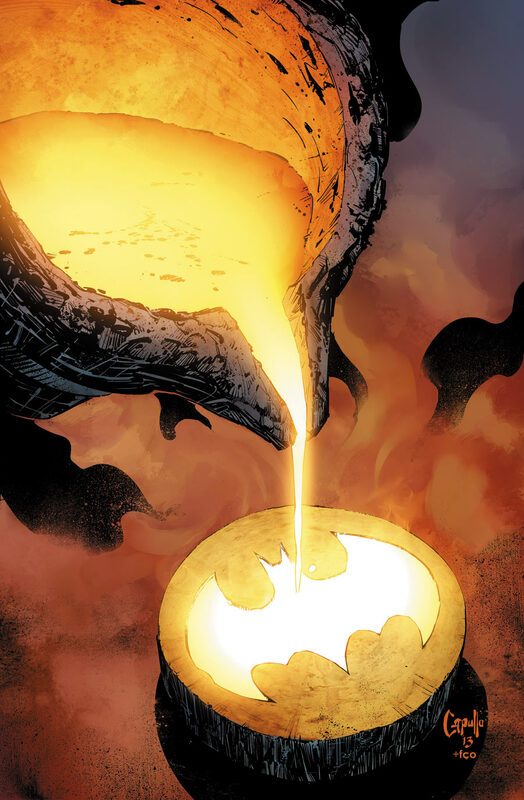 With a simple, symbolically resonant cover, Scott Snyder and Greg Capullo invite us to continue watching the very forging of Batman. Is the sophomore installment of Zero Year a must read comic, or has Snyder finally stumbled? Read on, friends, same bat-time, same bat-channel. Batman’s often been called the world’s greatest detective; a title many would argue belongs to Sherlock Holmes. The similarities between the two men have never been more apparent as Bruce Wayne employs all manner of eccentric gadgetry and clever disguises in order to capture that Napoleon of crime, the Red Hood. Though Snyder has never been shy about showing Batman’s raw physicality or mastery of the martial arts, he wisely uses them sparingly in this issue. This Bruce Wayne is a man (nothing more) fighting an urban war , and, accordingly, he is more cautious about it. He has neither cowl nor experience to hide behind, and the advantage that his cape and armor provide has rarely felt so obvious. But as Bruce shows us, that’s not at all crippling. Indeed, the biggest hole in Batman’s arsenal might just be the unconditional support of one Alfred Thaddeus Crane Pennyworth. One of the inescapable themes of the modern Batman story is family. I don’t think the that Bill Finger or Bob Kane intended it when they released Batman on the world, but over time, Batman has grown more and more powerful through the presence of his ‘Bat-family’, the team of close colleges and sidekicks who aid him in his quest. The symbolism has been clear: Batman was born from the tragedy of having no family, his ultimate victory is therefore to build his own. I’m not clairvoyant, but it seems like Snyder’s caught onto this too, and the things he’s doing with ‘family’ are interesting to say the least. As for the villain of the piece, this is really the issue where Snyder’s take on the original Red Hood started to click for me. In all previous appearances, the Red Hood has been a solid adversary for Bruce, but he neither felt like a rogue’s gallery stand-out on his own merits, nor entirely like a precursor to the Joker. That changes here. This time around, that devious sense of humor comes through loud and clear. The insistence that his mouth show (probably the biggest change to the Red Hood costume), the love of ‘the game’, the biting wit, it’s all Joker but not Joker. That’s the real strength of this issue, in fact. Snyder doesn’t write ‘Batman but green’, he writes ‘Bruce Wayne uninspired’ (the character is not his writing). I don’t know that I’ve ever seen a writer who was so able to make you feel the importance of age on his characters without ever mentioning it. κῦδος, Mr. Snyder. Tim Burton’s Batman mishandled the Joker in a lot of ways but one of the biggest was flagrantly ignoring the importance of the vat of acid in the Joker’s origin story. That acid did far more than change the man’s color scheme, it broke him. That’s why this image is a classic, it’s the real moment when the man called the Red Hood becomes the Joker. The Red Hood is a different man from the clown prince he shall become, just as Bruce is a different person from the Batman we know. The Red Hood sees the value in chaos, he appreciates the fun of a heist, but he’s still just a gang leader. You can just feel that the Joker’s coming for him, that he’d be furious if he could see such potential wasted. The Red Hood still clings to his control, even as he unleashes madness on Gotham. The Joker is what happens when he Just. Lets. Go. Snyder writes an excellent script that lives up to its premise of being a Bruce Wayne story but not a Batman story. Unfortunately, Bruce Wayne is just not quite as interesting as his caped alter-ego. The result is a slightly wordy issue that relies on gadgets and tricks a little too much. There is one action sequence, but it doesn’t contain all that much action. For some (myself included), the suspense of watching the story build to its breaking point can be exhilarating, but I wouldn’t fault any of you if you just got bored. I sincerely hope that Snyder doesn’t drag that out too long, or this could become a rather tedious arc. Before we tackle the art, I’d like to put forward a motion: can we please just give Scott Snyder the Riddler? Seriously, I’ve already written how much a love Snyder’s take on old Edward Nygma, but he proves, beyond the shadow of a doubt, this issue that he has the goods when it comes to the Riddler. The lone sequence featuring the once and future Riddler is, by far, the high point of the issue. I wish I could say more, but it really ought to be seen. I sincerely hope that Snyder continues to give one of Batman’s most underutilized foes such an excellent showing in future issues. Greg Capullo handles the art again this issue (gotta respect an artist who can keep up with this book), but it’s honestly some of his least impressive work in recent memory. Now that may sound harsh, but I actually can’t find very much to criticize. Mediocre Capullo is still miles ahead of the average artist, and that’s no slight against the average artist, either. Visual highlights from this issue continue to include Capullo’s excellent rendering of the Red Hood and the myriad of interesting images he gleans from the elegant simplicity of that shiny phallic helmet (what, I can’t be the only one thinking it). There’s also a rather impressive process of disguise and a suitably smug Edward Nygma. Capullo’s strength on this series has always been playing with light and darkness and that hasn’t changed. The scenes in the Gotham Museum and beneath Wayne Manor are visually stunning (though I admit that the latter also contains some of the issue’s weakest storytelling), leading to an incredible final panel that badly deserves the poster treatment. There are blemishes here and there. Vikki Vale, for instance, isn’t looking quite herself. And, silly as it sounds, I hate Bruce’s haircut. But really, when you’re complaining about hairstyles and cameos you know that you’re reviewing a very strong book. Ummm…the dinosaurs in the museum aren’t terribly accurate. Take that Capullo! Feel the sting of my pen! …Keyboard…they’re actually better than most comic dinosaurs…Man draws pretty comics. Capullo and Snyder have had a definite chemistry since issue #1, but the layouts in this issue continue to impress. The script seems to know exactly how to get the best impact in the amount of space provided and Capullo is an expert at bringing that script to life. One particular page in the museum is especially ground-breaking. While I’m certain it’s been done before somewhere, and the fact that this is a Batman event comic might encourage some to turn up their nose, it doesn’t change the brilliance and ingenuity of its design. The Riddler is the talkative sort and he can easily eat up precious space, but Snyder and Capullo manage to craft something out of Nygma’s wordiness that is actually more visually interesting. I was hesitant about Zero Year after reading Batman #21, but Snyder’s largely won back my faith. A truly excellent script and the work of a talented and dedicated art team make for an excellent look into Bruce Wayne’s past. Strange as it might seem to say about an issue of Batman, this issue is slightly better than it is enjoyable. It doesn’t surprise me at all the man who wrote this teaches college level courses on comics, but like many lessons (which in the right hands, I assure you this issue is), all the technical sophistication or innovative methods won’t fully take the sting out of less interesting material. On the bright side, though, what does that imply about the approaching debut of Gotham’s caped crusader? In the end, I felt that Batman #22 was only an above average comic, but one that was written excellently. Honestly, I kind of wish that this were a really awesome Elseworlds series. It’s almost as sad to lose Snyder’s modern day Batman stories to this as it is to think that there’s only going to be a year of this. It’s barely begun but, based on the little I’ve seen, if the CW wanted to make a Smallville for Batman, they clearly should have called Scott Snyder.